Don't miss a great night with family and friends! A free dinner will be served at 5 PM: hot dogs, chips and drinks. 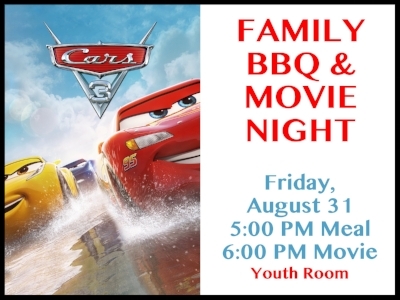 Cars 3 will be shown at 6 PM. Consessions will be available for a small fee. This will be a fun way to close out the Kids Ministries summer activities! Invite another family to join you!